Designer stubble goes in and out of style. From the 1980s-era tightly-trimmed beards of Don Johnson and George Michael to the more modern scruff of George Clooney or Leonardo DiCaprio, whiskers continue to grace the faces of fashionable men. Gray or graying stubble, however, may lend you an overly aged appearance, and you may not appreciate too "distinguished" a look. 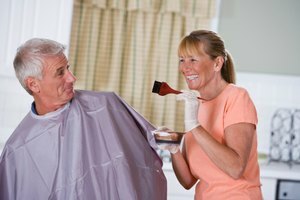 Dying gray hair requires more preparation than natural hair, as it isn't just another color. Gray hair has different physical properties and lacks minerals, which aid some dyes in developing. Determine the kind of dye you will need by examining the amount of gray in your beard. A beard with less than 40 percent gray hair may only require a semi-permanent color. 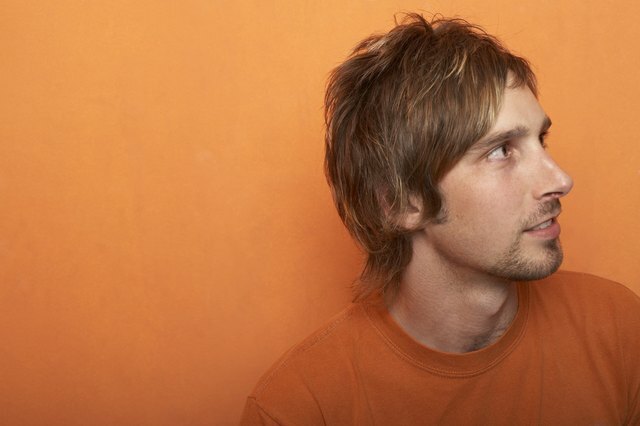 If your stubble is mostly or completely gray, consider a permanent color instead. Choose a golden or reddish hair color to turn your gray hairs into highlights. Avoid ash colors, which do not typically cover up gray. Darker shades contain more pigment and provide better coverage, but can also darken your naturally non-gray hair, resulting in an artificially darker, mismatched or conspicuous-looking beard. Wash and completely dry your beard to remove the natural oils from your hair. Do not use conditioner, as it may make your stubble more slippery than soap or shampoo alone. Slick hair follicles can repel color, causing it to roll right off the shaft and leave your beard color unchanged. Apply the color liberally to your entire beard and leave it in as long as the instructions recommend. You may be tempted to leave it in longer, to saturate your gray hair, but be warned this could damage your hair and irritate your skin. Wash the color out of your beard according to the product's instructions and examine yourself in a mirror. If the dye has stained your skin, gently wipe it away with a mix of equal parts lemon juice or baking soda and dish washing soap, a makeup removing cream or a small amount of toothpaste with granules, applied with a cotton ball. For stubborn dye stains on your skin, apply petroleum jelly or baby oil to your stained skin and leave it on overnight. The stains should wash away in the morning, or gradually fade as the day goes on. MayoClinic.com Health Library: Gray Hair: What Causes It? eSalon: What Happens if I Leave my Hair Color on Longer Than Specified in my Instructions?